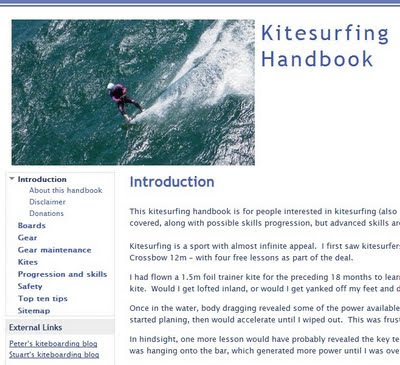 I have written this Kitesurfing Handbook with help from Stuart Webb to capture a lot of the information on this blog in a handbook format so it can be easily found. We have also provide links to additional information sources. The focus is on equipment, tips, safety and travel. Introductory and intermediate skills and techniques are also covered, along with suggested skills progression. Feel free to leave any comments or suggestions about the Handbook by posting a comment below. Hey Peter, i have emailed you directly, but thought i should also leave a comment. As a beginner who has only just managed to go upwind and land my first jumps, your handbook is a wealth of knowledge.... thankyou for putting this together, you have saved me a heap of research time and i hope that others take the opportunity to read the Handbook! I have now subscribed to PredictWind as it was a suggested site in your Handbook. PredictWind has allowed maximum kite time for me - i travel 1.5 hrs to get to Altona, but every time - to date - it is blowing as forecasted. Thanks again for the practical no nonsense approach to explaining the ins and outs of this great sport! Peter.J. Peter J, thanks for your feedback. It is great to hear you are up and going and have got some benefit from the handbook. Good winds! Hugh, thanks for the tips. I have been straightening my front leg more recently. This also tends to rest the muscles. I also ride with one hand (or both) near the middle of the bar on occasions too. I will work on the downwinder turns on both tacks as I tend to ride toeside only on my right tack at present. Thanks for the feedback. A PDF or eBook version is on my list of things to do, I will post an update if/when its available.